BatteryRefill.com will refill (re-cell) your worn-out battery at a much lower price than buying a new one. All you have to do is send your old battery with a Prepaid-Postage-Label that we email you after you have placed your order. We will then mail the refilled battery back that will run 20-40% longer than the original manufacturer's battery pack. Guaranteed or your money back! 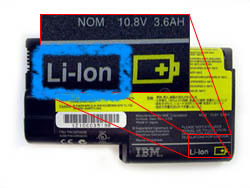 What is your battery Chemistry (Cell Type)? 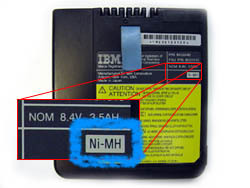 Check your battery label ! Copyright 2002~2013 by eBattery, Inc (BatteryRefill.com). All rights reserved.